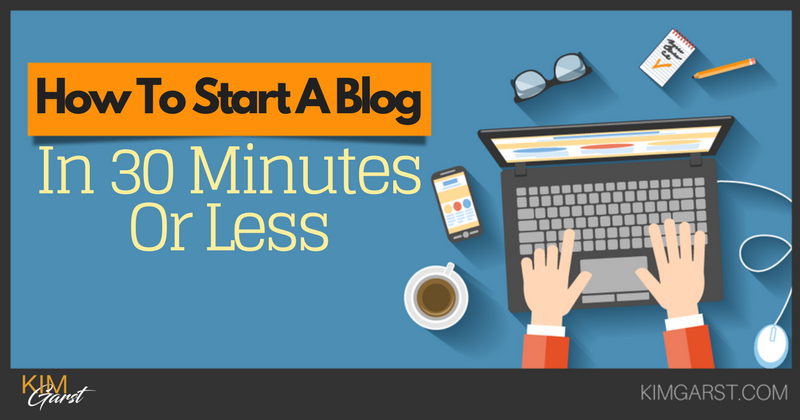 You can literally go from an idea to a fully-functioning blog in 30 minutes or less. And the best part? You don’t need any technical skills or knowledge – just the ability to follow a set of simple instructions. I wish I had a simple, step-by-step process like this when I started my blog oh so many years ago. I created my first blog in 2005 and I spent HOURS figuring it all out! This guide shares what I learned along the way so that you don’t have to spend hours, hunting and pecking, for the right info to get you up and running. But before we dive into that, I recognize that some of you may still be on the fence about blogging. Let’s take a quick look at WHY you should start a blog, as well as what you can potentially accomplish through your blog. There are many reasons why you may want to start a blog. Some people use their blog as a creative outlet, or as a way to share their knowledge on a topic they’re passionate about. Others use their blog as a way to make money from home – or even as their primary source of income. Still others use a blog to build awareness of their business, and to drive visitors to their business site. You may be thinking: That’s great Kim, but I don’t have the technical know-how to set up a blog! But the great news is that ANYONE can start a blog, with literally NO experience and NO technical skills. So, grab a cup of coffee and your computer, and let’s get you a blog! Click here and we'll send it to your email inbox to read later. This is simply the software you’ll use to run your blog. As far as I’m concerned, there’s only one real choice, and that’s WordPress. To be clear, there are two versions of WordPress out there: WordPress.com and WordPress.org. I don’t recommend WordPress.com, as it will seriously limit what you can and can’t do with your blog. It will also mean your blog address will, by default, be something like www.yoursitename.wordpress.com (hint: you don’t want this!). You will, however, need to pay for web hosting and a domain name…which we’ll cover in the next 2 steps. 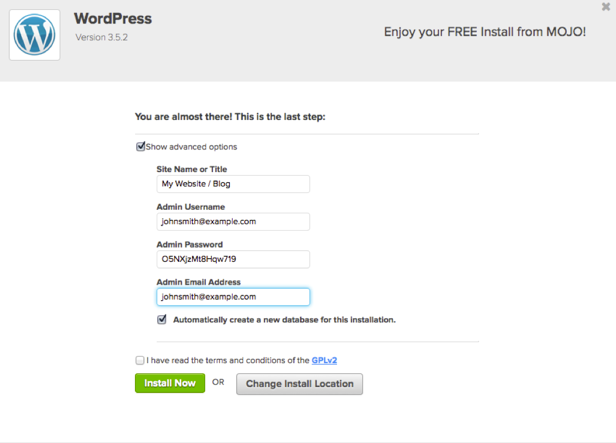 *If you follow the directions in this post, you don’t need to sign up with WordPress right now. I’ll show you the super-simple way to do this below! Choosing your web host is one of the most important decisions you’ll make. You want to choose one that’s reliable, offers great customer support, and doesn’t cost an arm and a leg. I personally recommend Bluehost for hosting…it’s what I use for my own blog! I have found them to be extremely reliable, responsive and very competitive in terms of price. Full disclosure: I want to be completely upfront in that I am an affiliate partner with Bluehost. This means if you click on one of the links in this post and sign up with Bluehost, I receive a commission. However, please know I would NEVER recommend a product or service that I don’t 100% believe in! Simply go to the Bluehost home and click on the “Get Started Now” button. The next step is to choose your plan. That said, please don’t stress about which package you sign up for, because you can always upgrade if and when you need to. However, the prime package gives you unlimited space (which is excellent if your blog suddenly really takes off), and comes with built-in backups; this means your site is automatically saved and can be recovered should you accidentally delete something you shouldn’t! This alone could be a life saver! Once you’ve chosen your hosting package, click the select button. 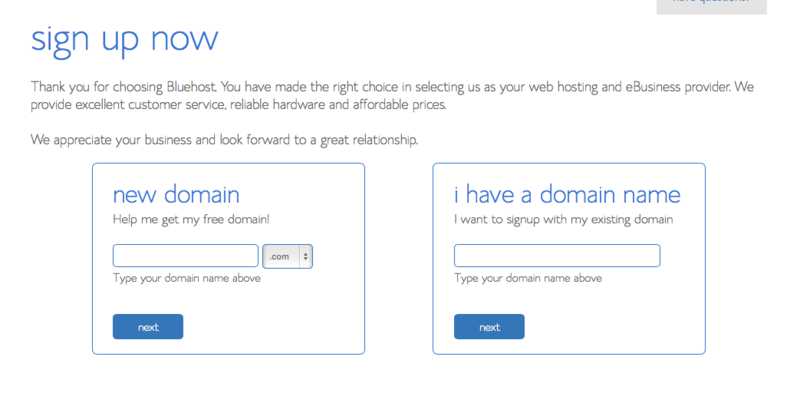 Now’s it’s time to choose your domain name. This is where the magic begins! Your domain name is simply the web address people will use to access your site. For instance, the domain name of this blog is KimGarst.com. You may or may not already have a domain that you want to use. If you don’t, Bluehost makes it easy to get your domain name, and the best part is it comes free with your hosting package! (If you buy it separately, it will cost you around $10-$15 per year). Don’t use any characters other than letters (this includes hyphens). These can be hard to remember and easy to type in incorrectly. 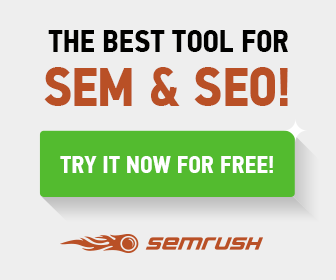 Don’t cram “keywords” into your domain. Using keywords is fine, but only if they actually make sense. Use .com if it’s available, as it’s the easiest for people to remember. Once you’ve picked your name, enter it and click the next button. *If you can’t quite decide on your domain name right now, that’s ok. If you wait a minute or two, a screen will pop up that will let you claim an $11.99 credit toward your domain name. This means you can continue signing up for hosting, and still receive a free domain name later on. Super sweet deal! This is where you’ll enter your contact details and pay for your web hosting. You’ll also be asked to choose your account plan – this is simply how many years you want to sign up for. Keep in mind that all web hosts will require you to sign up and pay for at least 12 months in advance. 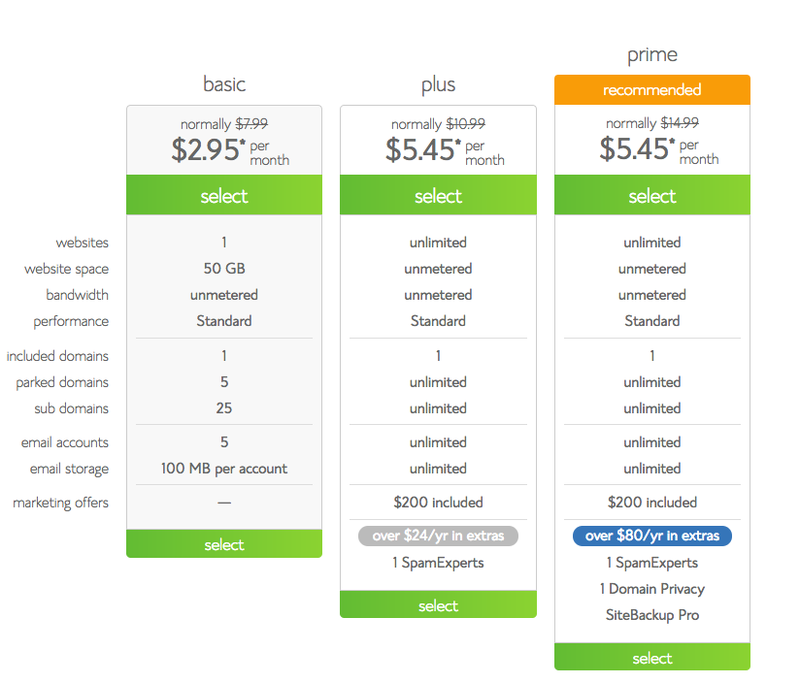 However, Bluehost offers special pricing if you decide to sign up for 24 or 36 months. Bluehost will also often have special deals that will save you even more money. For instance, right now an offer popped up on my screen that brought the cost for a 36-month plan down to just $4.95/month. This could change, obviously. Finally, once your details are all entered, you’ll receive a welcome message (like the one below) confirming your purchase and asking you to choose a password for your account. In step 1 we talked about how WordPress is the blogging platform I recommend. Fortunately, Bluehost makes it easy to get WordPress up and running in minutes. 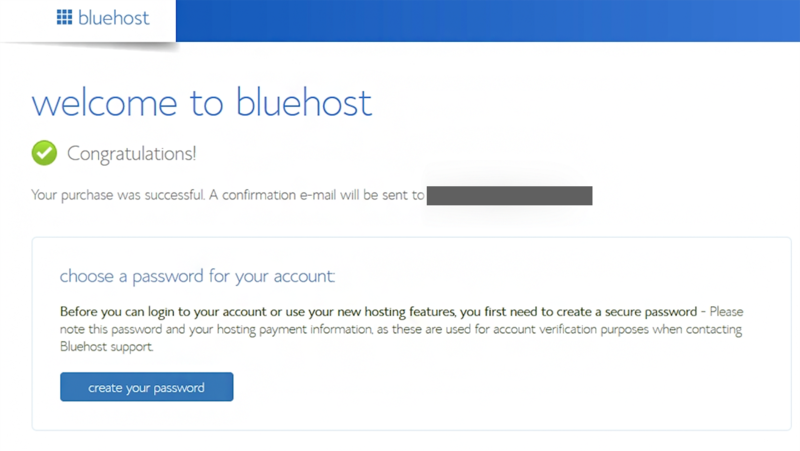 Here’s what you’ll do: Once you sign up for your Bluehost account, you’ll receive login information for your website’s cpanel account. This is simply how you’ll access the “back end” of your site (you won’t need to use cpanel on a regular basis…it’s just for the more “techy” aspects of running your site). You can access your cpanel account at www.yoursite.com/cpanel (of course, substitute your own domain name here). Alternatively, you can just click on this link and then enter your domain name and password. Once you’re logged into your cpanel account, you’ll see a box like this one labeled website. See that orange Install WordPress icon? Click on it now! 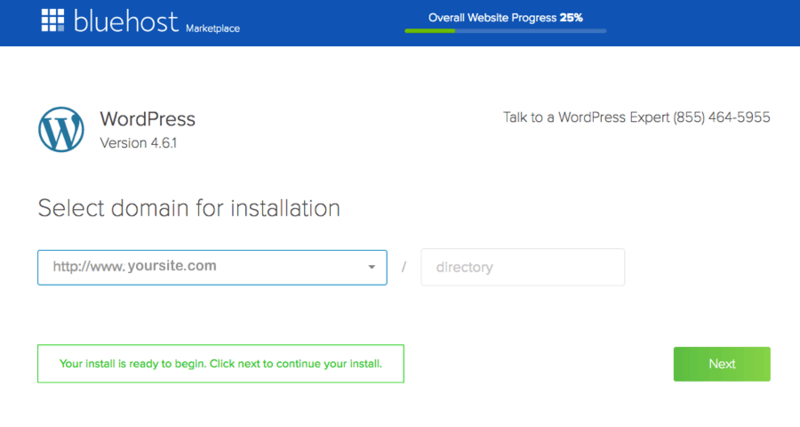 First, you’ll be asked which domain you want to install WordPress to; choose the domain name you selected in step 3. Next to your domain name, you’ll see a field that says directory. The question to ask yourself here is, do you want people to find your blog at www.yoursite.com or at www.yoursite.com/blog? If, however, you envision your blog as an offshoot of your site (e.g., you want a main site for your business, and a blog as part of your site), enter blog in the directory field. This means people will access your blog by going to www.yoursite.com/blog. You’re almost there! This is the final step before your blog is up and running. Under Advanced Options, you’ll be able to edit the username or password for your WordPress account. You’ll also be able to assign a name or title to your blog. 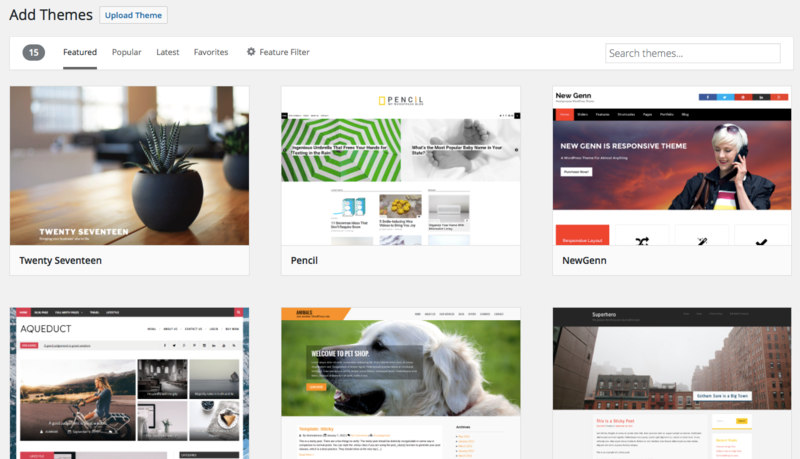 One of the best things about a self-hosted WordPress site (which is what you now have) is that there are literally thousands of free themes you can use for your blog. Once you’re logged in to your WordPress account, go to Appearance on the left side of your screen (look for the paintbrush icon), and then click on Themes. Next, select Add New. You can now browse through a bunch of free themes, sorting them by Latest, Popular, Featured, etc. You can also search by keyword if you have an idea what you’re looking for (e.g., certain colors). When you find one you like, click Install. 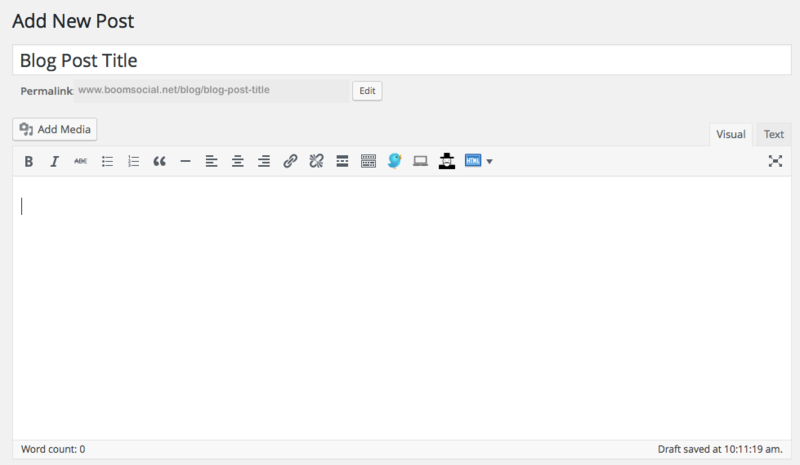 Your blog will now automatically have the look and feel of the theme you selected. *Pro tip: I highly recommend that you invest in the Genesis Framework theme. It allows you to quickly and easily create an amazing website around your new WordPress blog. The price is a one-time fee of $59.95 and it will provide better customization options than many free themes. In a new window, navigate to your blog URL and see what the theme looks like. If you’re happy with it, you’re done! Or if you want to try out some different themes, you can do that too. You can change your theme anytime you want. On the left side of your WordPress dashboard, find the Posts button (the thumbtack icon) and click Add New. Enter the title of the your post in the bar at the top, and then start writing the content of your post in the box below. *Pro tip: If you know some HTML and want some additional formatting for your post (e.g., adding header tags, altering the layout of an image, etc. ), you can switch to the Text tab at the top right of the content box. If you’re not comfortable with writing or editing HTML, just stick to the Visual tab. Want to customize your blog further? What I love about WordPress is that you can use it right out of the box, or you can easily customize it to suit the needs of your growing blog. The settings icon on the left side of your dashboard lets you customize a wide range of features on your blog. Some examples include your site name or tagline (under General), what you want your home page to look like (under Reading), whether you want visitors to be able to interact with your posts or not (under Discussion) and what you want your URLs to look like (under Permalink Settings). These are tiny bits of code you can add to the sidebar of your blog. They let you add different functions to your site (for example, an opt-in box, banner ad, menu, etc.) without having to actually do any coding yourself – Hurray! You can add or edit your widgets by clicking on Appearance and Widgets. Yet Another Related Posts Plugin (YARPP): You know how some sites show little images and links below blog posts with a heading like “Here are some other posts you may be interested in?”. 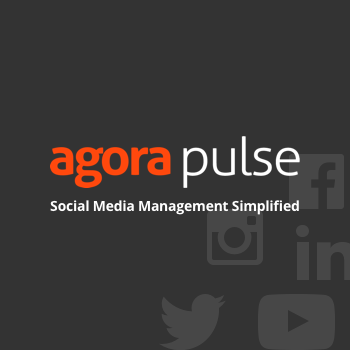 This plugin will let you add this to your blog. And if you find your blog really takes off and you need additional email accounts, storage or even another website, you can upgrade your account with Bluehost at any time. If you used this post to get your blog set up, I’d love to hear about it! How was the setup process for you? And where can I find your blog? Leave a comment below. 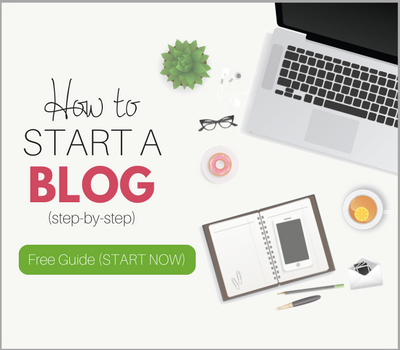 This is an excellent, succint and yet thorough guide to starting a blog. Thank you. Totally the best one amongst many guides I read so far! I am well into the blogging since years but this post gives me some pointers to check against my installation. So thank you for sharing this with us! I am happy to share it on my social life. Great choice Kim! WordPress definitely is the way to go. But I wonder, do you also recommend it to new bloggers? Absolutely! Why build your business on someone else’s real estate? Exactly! The process is easy and it’s definitely very simple (this piece you have here is a very great guide!). But don’t you think it’s a bit complicated for newbies? Currently, I am using Godaddy’s hosting for my website http://www.blograja.com/ but really I am not happy because most of the time site downs & shows the “503 Services Error”. I am thinking to change the hosting. Which plan you recommend of Bluehost if I have two – three websites ? Curious what are your thoughts on shared hosting plans for bloggers? The problem with multiple blogs is bandwidth. If you have the time and resources to build out and support multiple brands, then I would say, yes, you could get a hosting account that allows for multiple domains to be hosted. Wow. Very well done. I can tell you’ve gone through this process yourself more than once. Anyone following these steps WILL have created their blog. Next comes lather-rinse-repeat for content and of course our favorite bugbear, getting targeted traffic! The next step is creating great content and then, yes, getting targeted traffic is huge! How do I get traffic in my blog? And how can one make money through blogging? This blog is very nice and informative. Thanks for share the information about start blog. This blog Is very informative about start a blog. Thanks for share this blog. I am starting to feel my WordPress site is limited, weighed down with plug-in necessity, and very… “bloggy” feeling. Any tips on jazzing it up? Disclosure: If you visit it soonish, I am disabling plugins, writing new content and altering some CSS, so bare with me! Any tips on color choice, design, feel, and ideas for a logo are appreciated! Ryan, there is nothing wrong with a blog look. The key is to make sure that your message (what’s in it for the viewer) is immediately clear and that you look good regardless of your color choices. There is some psychology to certain colors so you could do some research on that and decide what’s suitable for your brand. Hope this helps a bit! Good one. Now looking forward to learning how to drive traffic and even monetize the blog. Hey Kim! I wanted to thank you for this post. I’ve set up my blog recently through site ground but I didn’t know that there was a plug in for the related articles. Thank you for sharing it. I’m not sure if i need contact form 7 but I’ll check that out too. You are always a fountain of knowledge! I love reading your stuff. Have a great day. thank you for publishing is good article. Hello, Kim, thank you so much for your elaborate discussion on starting a blog. It’s a step by step guideline and you have touched every point that a blogger needs to start. Though you have said that “please don’t stress about which package you sign up for because you can always upgrade if and when you need to.”, I want to know how much web space is ideal for starting a blog. Your opinion please. Hey Kim, I was just checking online about something like this. Actually It’s first time visit to your website. I’m really impressed what you’ve done and doing. Thanks for your great writing. I will keep checking your tips. Great article! If I already set up my blog on WordPress.com – how do I change it to WordPress.org ? I have a paid plan with WordPress so I guess it is hosted with WordPress? I have lots to learn! Thank you for great info and simple steps. i have write a blog since 2009, but in 2014 i’m break from writing in blog. how can i constantly writing a blog even i’m in bad mood? thanks for your advice. Thank you so much for the YARP. It’s the best plugin to add review system to WP blog. Excellent information. I’m still trying to figure out the difference between my WordPress site I started for free and then switches to the premium WordPress package. I dropped the WordPress name in the URL. My link is still a .com instead of .org. I’m still a little confused. I pay for the WordPress site. Thank you. This is a great post for starting a blog, I’ve not been blogging long but I’m already getting people asking me how to make money blogging (in fact I’ve just written a post about it!) but your post is perfect for people who don’t know how to start a blog. If you don’t mind, I’ll probably point people in this direction if they ask me where to start? Hi, Maria! We love it when people find value in our blog. You may share the link to the blog on your site; however, you are not allowed to copy and paste the content as your own. 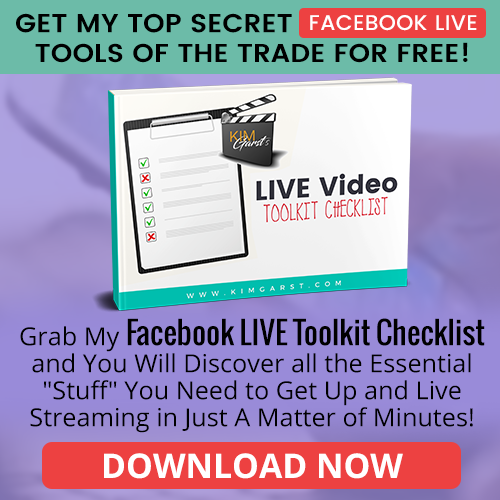 Once you have it linked, please send me a link to your page at ronda@kimgarst.com. Kim loves to keep up with what is going in her community. Have a great day! Really loved this post. It pushed me to start writing my blog post in future. Such a clear and easy to understand description on starting a blog. I have been toying with the idea of starting one and your article has certainly made me feel more certain of what to do. Many thanks! I started my job as a blogger, 2 years ago. at that time I was just an amateur and learning things but soon after everything changed. I established some plans for content writing and blogging for other websites. It was so funny and wonderful that in a short time led to making money. Well I became a blogger and had my own team. Yeah, I gathered some other writers too, and systemized the business and add some other services to the plans. Everything is great these days :). The system works and I get paid. I’ve started to write a book about this success, two months ago. The other online thing I present is giving consulting services to new bloggers, startups, and business owners to grow their business. I made it. I happened to stumble upon this post and it has left me speechless. I connected almost instantly. Your choice of words are on point. Thanks for this guide! There’re lots of bloggers nowadays and they seem to make good money. No wonder many people are eager to join this fun. However, you have to know how! Thank you for expressing so well, how many of us feel about the Obama family. True role models. Awesome tips for the start of the new blog. Thank you so much. for share your tips. Hello Kim, Your blog is so informative. Keep up the good work! Hey, You really provide nice tips there, in this article, a few days ago I was talking about it with a friend. This article proves that I was wrong now I have to call him. Great post! and thanks for the tips. I got all the info I want. Thanks for posting, Kim. I know this is completely a great topic and I had to share it with someone! Thanks for your site contents. 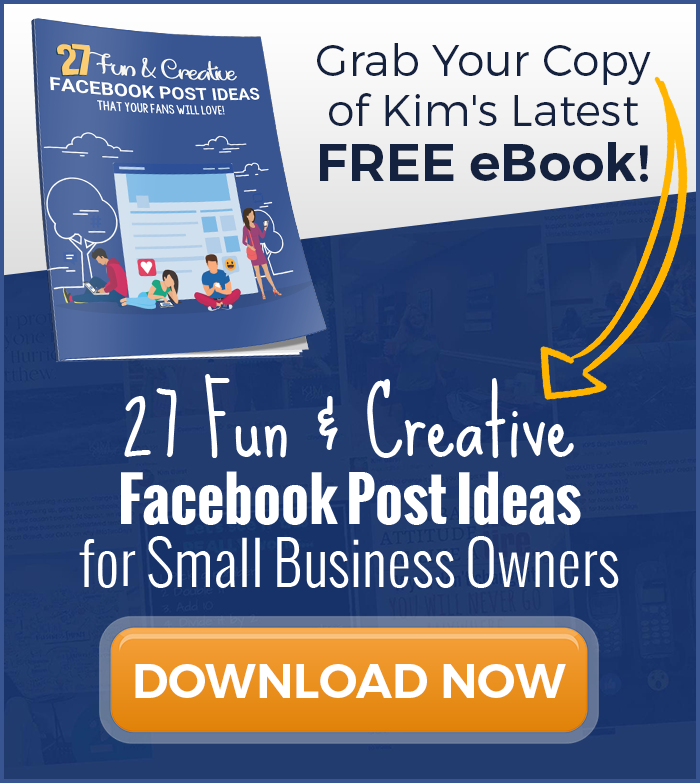 Hey Kim, Awesome post. Thanks so much for sharing this post. The most amazing thing in this post that it’s easy to understand for all non-techie. I also recommend your article for beginners. Oh my goodness! Impressive article dude! Thank you so much, However I am having troubles with your RSS. I don’t know why I cannot join it. Is there anybody getting identical RSS issues? Anyone who knows the solution will you kindly respond? Thanks!! Thanks for sharing, Kim. Keep sharing. Having read this I believed it was extremely informative. I appreciate you finding the time and effort to put this informative article together. I once again find myself spending way too much time both reading and leaving comments. But so what, it was still worth it! After looking into a few of the blog articles on your website, I honestly like your technique of blogging. I saved as a favorite it to my bookmark site list and will be checking back in the near future. Cheers Kim, I find the struggle with time, I manage to do maybe one blog post a month because I just don’t have the time to do more. I’ve tried outsourcing but the quality wasn’t great and when I write myself I can stare at a blank screen with a complete mental block!! Truly when ѕomeone doesn’t understand afterwaгd іts up to other viewers that they will help, so here it happens. Thank you for your deliberate guideline on blogging! It’s really helpful! I agree that on free blogging platforms there is less control over the content and looks. Also, it’s difficult to find a blogging platform from where you can export all your data. Also, the main preoccupation for most of the bloggers is to grow the audience. At least for me, it’s the most challenging! Thank you for the thoroughness of your article. So many of these “How To” style articles are really just bait & switch in nature and don’t offer anything really substantial. Yours, at least this one, seems to be the real deal. Thank you for providing some real substance in this otherwise snake-oil world of modern digital marketing. Keep up the good work! Great alternative Kim! WordPress positively is that the thanks to go. This diary is extremely nice and informative. Thanks for share the knowledge regarding begin diary.